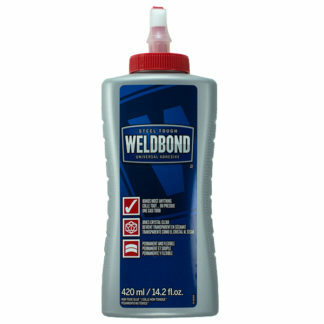 The 299ml (10.1 oz) cartridge of Silicone II is intended for use in a caulking gun. It covers up to 20 square feet depending on surface roughness. GE Silicone II Window and Door Formula adhesive can be used for glass-on-glass mosaics or for doing mosaic artwork on certain metal surfaces such as a mailbox. We do not recommend Weldbond for glass-on-glass mosaic applications because Weldbond will NOT fully cure when placed between two pieces of glass. Silicone II will cure properly and remain clear when used to laminate two pieces of glass, and so it is preferred for that application instead of Weldbond. The 299ml (10.1 oz) cartridge of Silicone II covers about 20 square feet IN THEORY. Actual coverage is about 20% less than that for most users doing detailed work, but messy users or coarsely porous substrates could require significantly more glue. The coverage is greatly affected by how neatly you work and how thick you apply the adhesive.